Earlier this summer, a group of 37 local community members traveled to Israel on the Federation’s Journey Home Mission to Israel. The week-long, interactive mission was designed to enable participants to follow their campaign dollars to the sites and programs funded by the UJFT’s Annual Campaign. 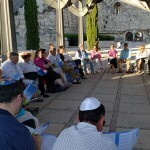 Upcoming issues of Jewish News will highlight more mission experiences. 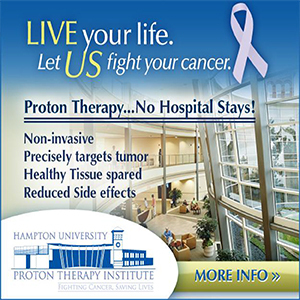 The first article about the mission appeared in the August 13 issue.The third article follows. “All roads lead to Jerusalem…” or so I like to believe, and so I say, especially when I unexpectedly stumble across a friend or acquaintance walking to or from the Kotel on a Friday evening. 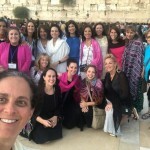 In June of this year, I was privileged to find myself with 36 friends at the Kotel on a beautiful Shabbat evening, and it really felt like magic was in the air. We sat together, sang together, celebrated together and took turns lighting candles inside a terrarium! If I’m honest, I’ll admit that it doesn’t take much to bring tears to my eyes…but this Friday night, for whatever reason…or for every reason…everything around me seemed “hi-def.” It was as though I could see every note stuffed into the crevices of the Kotel, feel every bump in the stones I walked upon, and hear every prayer being offered up by the women around me. And needless to say, it made me a little teary-eyed. Hinei ma tov u’manayim, Shevet ach-im gam ya-chad…are words I learned as a child growing up in my shul in New Jersey…and words that take on more and more meaning each time I am with my community. These are words that can lift my very soul on an erev Shabbat in Jerusalem. “How good and how pleasant it is when brothers and sisters can sit together in unity.” And so we did… sharing the joy and the beauty of Shabbat rituals, while binding ourselves to the collective memory of our People. How pleasant it was to share songs, prayers, and even “selfies” of our Kabalat Shabbat experience. Jerusalem is a special place. On Friday evenings it is a sacred space. 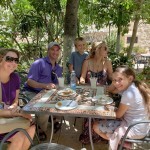 Shabbat in Jerusalem can mean a variety of things—it can be walking to services on Saturday morning; getting up SUPER early to get to Masada before it’s too hot to walk the snake path; or it can be a walking tour of the Old City. I opted for the tour and was not at all disappointed. Following in the footsteps of our guide Sarah Tuttle-Singer, we visited places on and off the city’s beaten path, stepping into each of its four quarters— sometimes at ground level, other times from rooftops—to see it through Sarah’s eyes—the eyes of a person who had lived there, gotten to know its inhabitants, studied its movement, then wrote it all down in a book: Jerusalem, Drawn and Quartered: One Woman’s Year in the Heart of the Christian, Muslim, Armenian, and Jewish Quarters of Old Jerusalem. Sarah’s tour brought us to places that many of us had never known (even those who’d been to the Old City many times). I was particularly surprised to walk into a building on Via Dolorosa, only to be “transported” like Dr. Who to a lush, flowering Austrian Garden, featuring bistro tables replete with steaming mugs of coffee and plates of strudel. I may or may not go back some day, but I was so glad to have been! Saturday evening had its own unique charms and memories, as we came back together to say farewell to our restful Shabbat and prepare to re-enter the work week (although with 20,000 steps on my tracker, it didn’t feel like much of a day of rest). Havdalah is enchanting. As a child I was fascinated by the way the congregation would reach toward the flame of the braided candle, turning their hands this way and that, casting shadows all about—separating light from dark and Shabbat from the rest of the week. That fascination remains with me to this day, as does the joy and optimism I feel as the service concludes with our collective hope of some day meeting with Elijah the prophet. 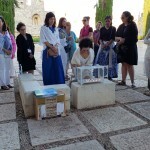 A mission to Israel infuses one with a sense of optimism. Even knowing that the days ahead remain rife with uncertainty for the Israelis. Even though the only certainty seems to be continued threats and difficulties. Shabbat in Jerusalem has a magical power to almost make one forget that so many complex issues remain unresolved for the people and the State of Israel. I know that my 36 friends and I continue to hope for the peace and safety of those we met along our journey, as well as those we may never know. And as the High Holidays continue, we add them all to our thoughts and prayers, even as we look forward to renewing our acquaintances. If it’s true that all roads lead to Jerusalem, then I encourage you to “find yourself” there—under the blue sky, making clear memories of your own.